UK offers £7m for Calais security Jump to media player Home Secretary Theresa May has promised up to £7m to boost security at Calais, in the wake of the migrant crisis. Migrants scale Channel Tunnel fence Jump to media player Some 2,000 migrants tried to enter the Channel Tunnel terminal in Calais on Monday night in an attempt to reach the UK, operator Eurotunnel has said. A chaotic Channel Tunnel journey Jump to media player The BBC's Joe Inwood made the journey through the Channel Tunnel to see exactly how tough it has been for travellers. 'People here fight for food' Jump to media player Thousands of migrants have arrived in Athens in the past week after being smuggled onto Greek islands, one 12-year-old girl spoke to the BBC about her journey. The plight of Calais migrants Jump to media player Calais migrants have been protesting for better protection of their human rights and freedom. Life in the UK as a Romanian migrant Jump to media player It has been almost a year since restrictions were lifted on Bulgarian and Romanian migrants, leaving them free to come and work in the UK. Eurotunnel has revealed that around 2,000 migrants attempted to storm the French terminal at Calais on Monday night. Police confirmed it was the biggest attempt to make the dangerous journey to Britain in recent weeks. 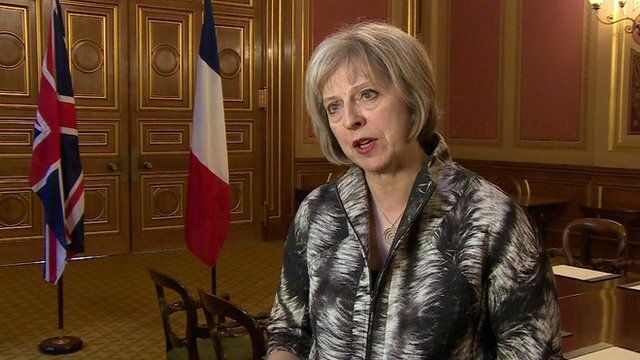 It comes as Home Secretary Theresa May met her French counterpart to discuss the ongoing disruption on both sides of the Channel. She promised up to £7m to boost security at Calais.